Elections are approaching fast in Hungary, but this is an EU country that does not need to be afraid of Russian election meddling, experts say. Yes, pro-Russian internet trolls are at work and there are about a hundred fake news sites operating in Hungarian, but they are not very influential, and they do not even need to be . The reason for this is that the Hungarian government has a friendly relationship with Russia and its taxpayer-funded media empire is happily pushing out the Kremlin’s messages. Young men are standing in line, about ten in a row, waiting. Their faces are dark and their hair is black. They look tired. The photo was taken in Slovenia in 2015, during the peak of the European migration crisis. The men are asylum seekers who have just crossed the border from Croatia and are waiting to be taken into a refugee camp. Now, in the heated stretch-run of an election campaign, a closely cropped version of this photo can be seen on billboards all around Budapest, with a big red STOP sign on it. Tiny, almost invisible letters on the top say that it is ‘Government Information’, which only means that the Hungarian taxpayers are financing this latest fear-mongering campaign. 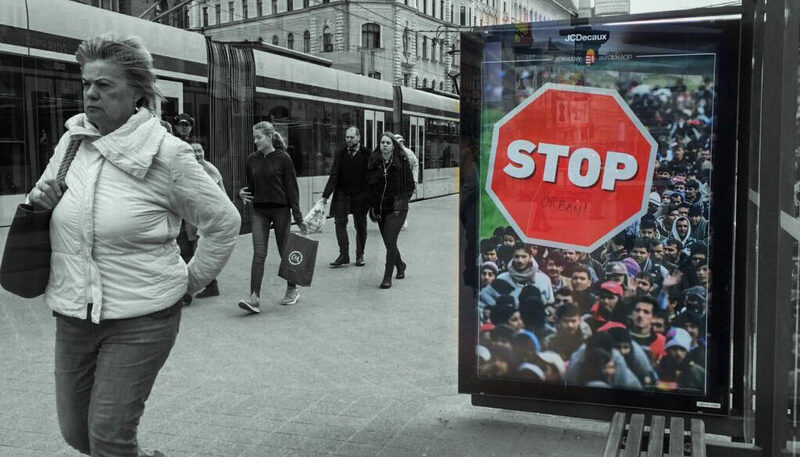 The ad is the latest tool in an election campaign, in which the governing party Fidesz is only talking about one issue – migration. Besides trying to position itself as a savior in front of voters, the Orban government is using the issue of migration to wage a war against Brussels, George Soros, the opposition and NGOs. ‘In Hungary, there is almost no information warfare because there is practically no opponent in the mainstream to fight, and pro-Russian disinformation comes directly from government-organized media. Hungary is the least expected to experience election meddling given the strong pro-Russian stance of the ruling Hungarian Fidesz-KDNP, and its main challenger, the far-right Jobbik is also pro-Russian’ says a study titled ‘Does Russia interfere in Czech, Austrian and Hungarian elections?’, published last year by think tank Political Capital. According to the above report and several news reports, there are about at least a hundred fake news sites operating in Hungarian that are spreading pro-Russian propaganda, and most probably there are fake social media accounts pushing those stories on Twitter and Facebook as well, but their role remains limited. The reason for this is that the state-run and state-sponsored mainstream Hungarian media are spreading many of the ideas pushed by Moscow. The entire government-leaning media empire, heavily funded by Hungarian taxpayers, is pushing the anti-immigration and anti-Soros narrative that is supported by the Kremlin as well. The Hungarian and the Russian government-sponsored media echo each other; which means that there is no need for the fake news sites and Russian trolls to spread the Kremlin agenda. The video is spread on YouTube and Facebook as a paid advertising, and it is spread by, among others, government-aligned origo.hu. But reporters from hvg.hu uncovered that the video was fake. 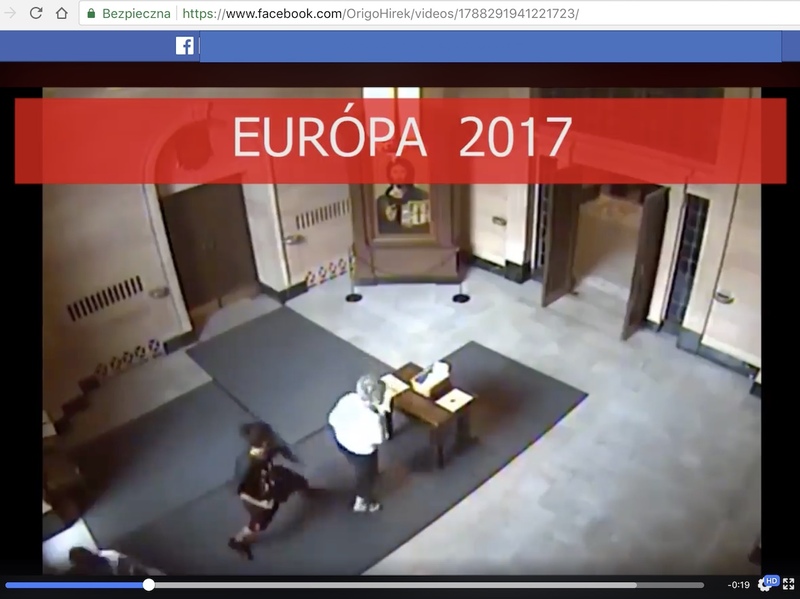 They found that the incident happened not in Europe in 2017 but in 2015 in the United States. The attackers in the video were not migrants and the sounds of ‘Allah Akbar’ are also fake. The sound was added later. The video is still available on Facebook has been viewed by more than 250 thousand people. The public service media is no better and doing the same. All these prove that the taxpayer money is spent on spreading fake news and political propaganda. The public service TV channel called M1 ran a story about a Hungarian-Swedish woman who claimed to have moved back to Hungary because she feared living in Sweden now because of the threat of migrants. News site 444.hu found out that the woman’s version of the story was not accurate: she had been living in Hungary for two years and had been convicted of several crimes in Sweden, including slander and harassment. Most ironically, reporters also uncovered that she had herself arrived in Sweden as a refugee. Having their lies exposed did not stop the public service channel M1 from spreading the video as paid advertising on social media as well. Though Facebook later deleted the video, by then it already got more than a million views, according to a story published by the channel. Spreading Russian-style misinformation is not new for the public service media or government-aligned outlets. These media outlets have been happily and regularly quoting information from Russia Today/RT and Sputnik News for years now. They have been using the Kremlin’s methods as well. Russian propaganda often uses confusion as a tool, suggesting that nobody is to be trusted, and there are several examples of this in Hungary. One of Hungarian public service media’s favourite experts – György Nógrádi, was interviewed by the public service radio the morning after the Malaysian airliner MH17 was shot down above Ukraine. He stressed that both Russians and Ukrainians would keep lying about the event and that we would never know what really happened, thus undermining the concept of truth as such. The same expert, a man with questionable academic reputation, is often quoted by the public service media on the topic of migration as well. He talks about migration almost exclusively in threatening terms. If you search the archives of the website of the public service media for his name and the word ‘migrant’, you will get about 480 hits. After the terror attack in Brussels, another ‘expert’ said on the public service TV channel that he had read on Syrian and Tunisian news sites that the attackers were Islamist converts from Belarus and that local Belarusian authorities had warned Belgian police about the threat in advance. This was actually a fake story spread not by Tunisian but by Russian media and, as a video by 444.hu points out, the whole point of it was to suggest that Belgian authorities did not do anything to prevent the attack. It is also telling that several times the government-aligned Hungarian media quoted documents found on the DC Leaks website – a website that was created and run by a Russian intelligence operative. According to journalist Szabolcs Panyi, pro-Orban media quoted DC Leaks more than a hundred times. It is not only the media, but the government itself has also been using DC Leaks materials for its own purposes. Last fall Fidesz spokesman Balázs Hidvégi cited DC leaks as ‘evidence’ that Brussels was ‘in the grip of’ George Soros. The website was also quoted by a powerful government minister János Lázár who oversees the intelligence agency. It is not only mainstream media that quotes questionable pro-Russian sources in Hungary, it works the other way as well. The most popular and one of the most notorious anti-migration fake news sites, napimigrans.com (‘daily migrant’ in English) often quotes stories from the government-funded official news agency, MTI or the website of the public service media, hirado.hu. The site also often quotes origo.hu and 888.hu as well. The latter is a website owned by Modern Media Group, which is a company co-owned by prime minister Orban’s advisor, Árpád Habony. The leading story on napimigrans.com in March 2018, at the time of writing this article, was an alleged leaked recording of George Soros, and the sources of the story are origo.hu and Magyar Idők, two government-sponsored outlets. Even hidfo.ru often quotes MTI, origo and other mainstream pro-government Hungarian sources. On March 29, 2018 its latest story on domestic Hungarian politics was quoting origo.hu. Also pro-Russian sites are heavily supporting Orban during the election campaign. Even though the Jobbik party – Orban’s most powerful opposition, is also pro-Russian, it is being attacked by the pro-Russian sites. Hidfo.ru recently called a Jobbik protest – a ‘failure’ and categorized the far-right party as ‘left-liberal’. The Hungarian government’s turn towards Russia has been continuous since then. In January 2014, Orban unexpectedly went to Moscow and announced that he signed a contract with Putin about Russia building new reactors for the existing Paks nuclear plant in Hungary. The deal is worth 3000 billion Hungarian forints (ca. 11.85 billion U.S. dollars), and the project is financed by a loan from a Russian bank. Also, in the past few years Putin has been a regular guest in Budapest, showing Brussels that he is still welcome on the territory of the European Union. At the same time, Russian intelligence agencies reportedly became more active in Hungary and according to news site Index, members of the Russian intelligence services held regular military exercises with far-right paramilitary organization called Magyar Nemzeti Arcvonal. The leader of this organization, István Györkös was running hidfo.ru, the only Hungarian fake news site that is confirmed to have direct Kremlin connections. The strangest and most high-profile Hungarian fake news story is actually connected to hidfo.ru. The website was practically unknown, until one day in 2014 the Russian foreign minister quoted a story published on hidfo.ru. The story included photos of tanks and suggested that Hungary was sending those to Ukraine in the middle of the Ukraine-Russia conflict. The story was fake, but it revealed hidfo.ru’s connection to the Kremlin and the site was soon after moved to a server in Russia. ‘Hungary is not a target of Russian propaganda any more. Hungary is an ally, which means that fake news sites work in a different way than they do in other Visegrad countries’ says Lóránt Győri, researcher at Hungarian think tank Political Capital. The friendship is obvious. Hungarian state news channel, M1, produces a Russian-language newscast. The Russian channel RT is now available through major cable provider UPC. The Hungarian state sponsors the renovation of orthodox churches and Patriarch Kirill, the head of the Russian orthodox church is reportedly planning a trip to Hungary this year. Also, the University of Debrecen gave a honorary doctorate to Putin. Győri agrees that the impact of fake news sites in Hungary is low, but he thinks that it is still important to realize that ‘they are here and they are putting time and money into running them.’ Also, they provide a good picture of what Russia wants to say; they serve as a messaging board. Győri thinks that the ‘tank story’ on hidfo.ru was supposed to tell the Hungarian government that Russia was watching and that the friendship could be easily broken. Győri says that it is important to keep in mind that the Hungarian turn towards Russia was not a grassroots movement but something decided by the governing elite. The majority of Hungarians are pro-Western, and there is not a sizeable Russian or orthodox minority in Hungary, and people generally do not speak Russian. All this means that the Hungarian government needs to be cautious about pushing Russian propaganda too hard. However, Győri adds, 40-50 percent of people in the whole region are undecided when it comes to the question of whether they support the East or the West, which means that they are vulnerable to pro-Russian propaganda. Also, while the majority of Hungarians support EU and NATO-membership, they are more susceptible to believing fake news when it comes to specific issues. For example, they are open to the idea that the U.S. intelligence agencies were behind the revolution in Kiev’s Maidan Square. According to Győri, there are three major topics present in the Hungarian media controlled by the government that are connected to the Russian propaganda messages. The first is migration. Russia uses the topic of migration to convince the audience that Western countries and the European Union are doomed because they cannot deal with the influx of Muslim asylum seekers. The second common topic is the idea of sovereignty and autonomy. The Hungarian right is supporting this idea because it wants autonomy for Hungarian minorities in neighboring countries and it is pushing for more sovereignty for nation states inside the European Union. The far-right simply wants former Hungarian territories to be given back to the country. Russia is supporting this idea because of the war in Eastern Ukraine and Crimea. The third is the pragmatic argument. The Hungarian government claims that by being closer to Russia, the country can enjoy the benefits of close trade relationships with the Russian economy and get access to the huge Russian market. The messages fly both ways, creating an echo chamber. The study of Political Capital states that – ‘The Kremlin’s narrative is directly using the Hungarian PM’s conspiracy theory quoting Viktor Orbán on Russia Today about George Soros, a Hungarian-born American billionaire and human rights philanthropist “driving the invasion” of mass migration into Europe’. Experts and journalists have been wondering for years why the government-funded Hungarian mainstream media was so eager and happy to quote RT and Sputnik and to spread Russian-type misinformation. For a very long time their idea was that it was not intentional. They blamed it on incompetent and lazy editors who did not know better. But a recent study suggests that the connection might be more than accidental. A study published by the Corruption Research Center Budapest (CRCB) in March 2018 examined the content of both government-sponsored news media and independent news media in order to figure out whether their content was in any way similar to that of pro-Russian fake news sites. The pro-Russian site that was the basis of the analysis was hidfo.ru – the only Hungarian site with proven Kremlin connections. CRCB’s starting hypothesis was that they would not find any similarities between the content of mainstream Hungarian sites and the pro-Russian site, but this turned out not be true. The study examined more than a million articles from the websites 888.hu, hidfo.ru, index.hu, lokal.hu, magyaridok.hu, mindenegyben.com, mno.hu, origo.hu and pestisracok.hu. They were interested in four topics: how often the portals write about Russia in a negative light; how they use the words ‘migrant’ and ‘refugee’, whether they make a connection between the words ‘migrant’ and ‘terror’ and ‘migrant’ and ‘violence’. The results of the content analysis showed that the government-friendly news portals (888.hu, magyaridok.hu, origo.hu and pestisracok.hu) were showing similarities with pro-Russian fake news site hidfo.ru in the above questions, but independent sites (index.hu and mno.hu) were not. Government-aligned media was less likely to write about Russia and Putin in negative light and more likely to draw a parallel between migration and terrorism and violence than the independent sites. Government-aligned mainstream media was covering those topics similarly to pro-Russian fake site hidfo.ru, and not like independent mainstream media. One of the most interesting results of the CRCB study is that mindenegyben.com also turned out to be echoing the topics and word choice of Russian propaganda. This is an extremely popular site in Hungary that usually spreads non-political content of questionable quality: clickbait articles, listicles and unreliable healthcare information. However, CRCB found, when it comes to political content, that it shows similarities with Russian propaganda. The CRCB report concludes that the most interesting aspect of the study is that while in other countries governments are fighting Russian propaganda, the Hungarian government ‘opens the door’ to it. ‘Paradoxically, but a not very small share of this activity is financed by Hungarian taxpayers’ they add, referring to the expensive state advertising published by these sites. These news portals receive an enormous amount of money for running state advertising (propaganda); this is one of the ways the Orban government finances friendly businessmen who own the media companies that uncritically support its policies. VSquare partner Atlatszo.hu has been tracking how much the Hungarian government is spending on propaganda. Last year the Orban government spent €40.5 million on anti-Soros and anti-immigration propaganda alone. Atlatszo’s research also shows that one third of all that money flowed to media companies owned by Lőrinc Mészáros, mayor of Orbán’s home village and the man who is getting rich faster than Mark Zuckerberg. This is the first publication in a new series of VSquare’s blog posts on the current events in Visegrad countries.